Plot – Young island princess Moana (Cravalho) sets off on a perilous journey to find demi-god Maui (Johnson) and set about righting a wrong that Maui had caused many moons ago that is now threatening to destroy Moana’s quiet tropical village. At this present moment in time it feels as though Disney has a license to print money and their certainly not stopping anytime soon with countless remakes on the calendar for the next few years and original properties like last year’s Xmas time animated hit Moana that are finding instant successes with their target audiences, that will likely see them become family favourites in the present and the years to come. You can almost envision the Disney power players gathered around the table, their eyes lighting up at the pitch of Moana, about kindly and magically gifted young girl (continuing on the Mouse House’s recent output of strong willed female heroines) that just so happens to be an Polynesian native (covering off the diversity side of requirements) all the while having a story that’s conveniently tailored made too a few song and dance numbers that will have the kids singing and adults wishing they never bought the official soundtrack and you can pretty much guarantee in a few years’ time Moana will be hitting a stage near you too live its new life as a feel good audience pleasing stage hit. 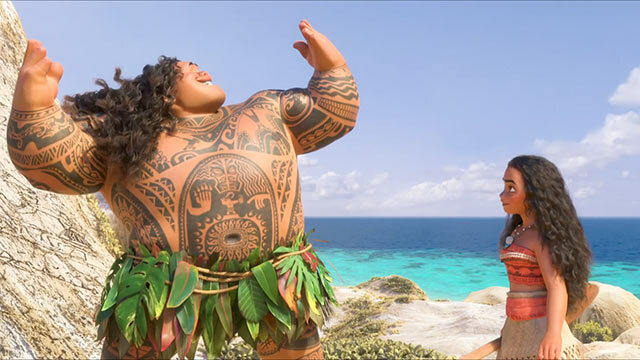 It really does feel as though Moana owes a lot to past Disney hits like Mulan, The Lion King and recent box office behemoth Frozen and while the island/ocean setting of the story and the addition of everyone’s favourite ex-pro wrestler Dwayne Johnson as the voice of Demi-God Maui set’s Moana a part from these films, Moana doesn’t actually end up delivering anything that fresh or new to the old age staple of young protagonist that doesn’t mind being a rebel saving the day after an adventure filled quest and it’s a shame that Moana doesn’t utilise its ample potential to become anything more than a nice piece of colourful entertainment. Filled with animal sidekicks (crazy eyed chicken Heihei steals the film), the aforementioned musical numbers that are more pleasant that instantly singable and Moana herself who’s voiced with a lot of life by rising star Auli’i Cravalho but the film never truly breaks out to join the ranks of classic Disney heroines, Moana as a whole remains constantly middle of the road and you’d be hard pressed to find many that will be mentioning this outing in the future years as Disney unloads more and more similar fair into the great wide world. Energetic and sometimes laugh out loud funny, Moana is an audience appeasing event that’s tailor made to keep the little tykes content and the senses dazzled but the heart that transforms some Disney films into the instant classics they become is curiously missing here and it stops Moana from being anything but a mostly forgettable diversion. “…it feels as though Disney has a license to print money…” ha ha ha! I certainly wouldn’t mind having some shares in their business at present! That is actually very likely to be what happened ha. I thought this film just lacked a little magic to be honest, it felt more like a cash grab and while enjoyable I don’t think many will be talking about it in years to come. Yeah, especially considering that disney is probably going to do like 8 more of these movies as long as people keep praising their images of empowerment and the music keeps blowing up. to be clear I think empowerment is great, just not when it is clearly a monemaking gimmick. Good review. Personally, I liked this movie (more than you guys did). I think Moana is more in-line with its own “Disney” identity than so of its other endeavors like Wreck-It-Ralph or Big Hero 6. It had some moments for me Jason but overall found it rather forgettable in the big scheme of things and not even close to Disney on peak form. When you watch a really good Disney, your always pretty up for another watch pretty soon after. Not necessarily. The Disney films that I really like are ones that stick with me for days, besides that’s for really good Disney. Moana doesn’t fit that. Thus, average. Yep average as they come I reckon! Hoping their next venture is a little more magical. I think it will be. Coco looks to be gorgeous in a new setting…or is that Pixar? No, Pixar is still doing sequels so it has to be Disney. Mostly forgettable diversion is how I would describe Moana as well. Gorgeous stunning animation, so-so story, by-the-numbers drama and character development. It’s really telling if you try and compare its “Mufasa in the stars” moment to the one in The Lion King, and how much punch and emotion one has compared to the forced drama of the other. Some great points there! I think the critics got this one pretty wrong it was well over hyped.